This is the family history of Jesus Christ. He came from the family of David and Abraham. Abraham was the father of Isaac. Isaac was the father of Jacob. Jacob was the father of Judah and his brothers. Judah was the father of Perez and Zerah. (Their mother was Tamar.) Perez was the father of Hezron. Hezron was the father of Ram. Ram was the father of Amminadab. Amminadab was the father of Nahshon. Nahshon was the father of Salmon. Salmon was the father of Boaz. (Boaz' mother was Rahab.) Boaz was the father of Obed. (Obed's mother was Ruth.) Obed was the father of Jesse. Jesse was the father of King David. Matthew's Gospel, while in many ways the most Jewish of the Gospels, emphasizes God's love and grace for all people. At the beginning of Jesus' life on earth, he is welcomed by foreigners, Magi, who come from many miles away to worship him. 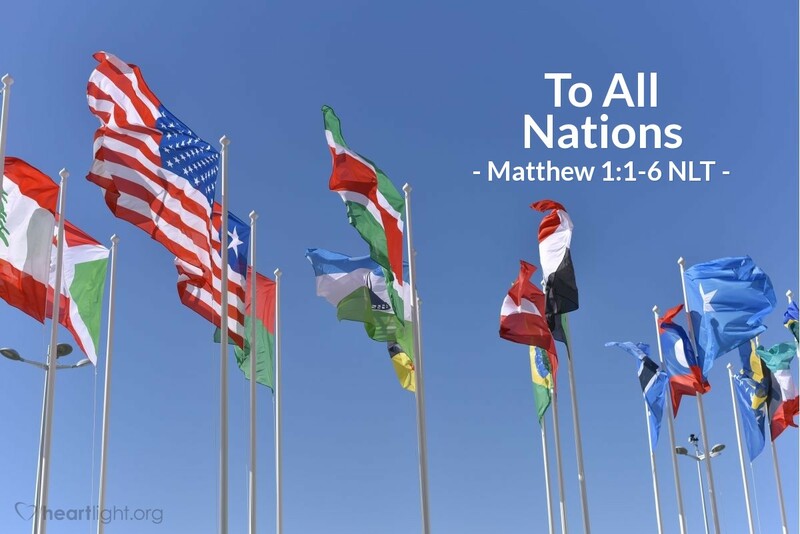 At the end of Jesus' life on earth, he challenges his disciples to go tell every nation about him and his good news, baptizing them and welcoming them into God's family. Even in the genealogy of Jesus, Matthew prepares us for the fact that, by God's grace, all people can be included in God's family. In the lineage of great King David, and the Messiah Jesus, is a Gentile woman. Her name is Ruth, and her story is a marvelous story of God's grace and the faithful heart that finds its home in the God of Israel. Father God, LORD of all peoples, please use my study of the Gospel of Matthew this year to awaken my heart to the needs of everyone to know about Jesus. Please give me more understanding and make me less judgmental of other cultures and races. Help me see your image in each person I encounter and see each one's need to know you as Abba Father. In the name of the Lord Jesus I ask this. Amen.